I grew up working on a show called “The Beachcombers.” As a budding actress and a cast member of a somewhat iconic west coast show, I often thought in terms of cultural references that were drawn from the world of entertainment. That show, for people around the world, defined the rugged West Coast of Canada. For me, it merely echoed the beauty that was my home. For many people when they think about the future,they draw references from similar sources, such as tv, movies, and books–only the future is rarely filled with a vision of beauty. “Clockwork Orange,” “Brazil,” “Blade Runner,” “Mad Max,” ”The Matrix,” “Divergent,” “The Hunger Games.” Those are the cultural touch points that we have for thinking about the future. It’s no wonder that we have such a hard time creating a sustainable world when we have nothing on which to base that vision. Rather than presenting the utopia that we could create, these films, and in fact most of our cultural references are based on a horrific dystopian vision. But for me, when I think of the future, I still think about the beautiful, rugged and wild coast that we showcased in the “Beachcombers.” That’s because that vision was reality. I can still see it when I look out my window, although, every day I feel it slipping away more and more as the talk of development overshadows the talk of sustainability. As BC, and in fact, all of Canada falls under the spell of the magicians that promise untold riches and as we lose the ability to picture ourselves as more than just petty merchants of raw resources. Why is it that we are unable to picture a future that involves both sustainability and development? Why is it that we seem so much closer to Mad Max’s version of the future than a sustainable one? That’s because sustainability still often feels like a shapeless topic discussed in vague declarations. It’s like peace or hope. Everyone wants it, but no one really knows what it looks like. And that’s what I see missing in the World: the leadership to create a better vision; a vision for the potential of our people and the leadership to generate real, sustainable wealth so that we can all share in the benefits. That’s what we are talking about today is how we can share the wealth. Well sharing it until it is gone isn’t something I want to tell my children I did. That’s a price I don’t think I could pay. I want to create wealth that comes from a place that values the future as much as it values the present. Because the cost of our lack of vision is an unsustainable future. And an unsustainable future is what we’ll get if we don’t stop and look at how we are measuring wealth. How do you measure the cost of a lost whale song? Could you put a price on the unique pod that was lost to the Exxon Valdez? What about the cost of an oil spill in a schoolyard that causes cancer or affects the development of a child’s brain? Kinder Morgan can tell you; it’s the millions of dollars they spent fighting parents in court to avoid any liability in a Nevada pipeline spill. These kinds of costs often don’t make it onto the bottom line, but they are a big part of what the Dutch looked at when they decided to become world leaders in wind energy. They wanted to be self-sufficient, and they had a vision for developing their resources sustainably. Now it is a third of their economy. What about the Japanese? A land without resources. Their vision gave them the ability to become world leaders in technology. Do you realize that one company, Toyota, spends more on R and D than our entire country spends? Everytime the wind blows, and we aren’t generating wind energy we are losing money. Every time the sun shines, and we aren’t generating solar power, we are losing an opportunity to empower ourselves without endangering our communities and their future. 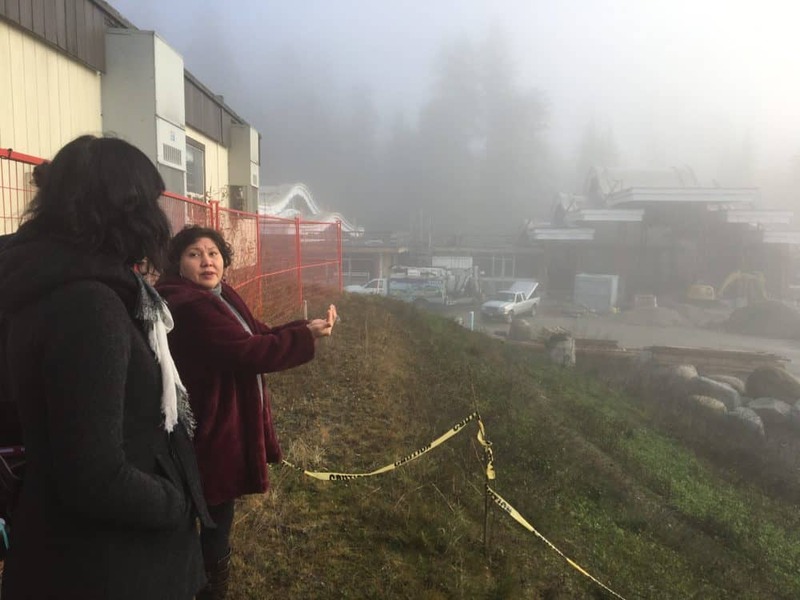 This is why the Tsleil-Waututh Nation is building a large solar power project as part of our new admin building and health centre. When completed it will generate approximately 47,000 kWh a year of clean energy. Which is fantastic by itself but even more importantly we intend to inspire people to see a different vision of the future. We are inviting the general public to join us in raising funds for this project and to help tell the story of the need to speed up the transition to renewable energy. We have partnered with the Great Climate Race to give anyone who wants to help tell this story a chance to do something good for their own health and the health of the planet. This is the most critical conversation we all need to be part of internationally. Already we have seen people getting involved from as far away as Indian and Bulgaria and South Africa. In today's day and age, we can all play a role in being the media, and we can crowdsource funding for the solutions we all need. Will you help us raise funding for this critically important project? Let's provide a counter-story to the Kinder Morgan terminal on the other side of the inlet from where we are building this project. Let's tell the world that we can and must speed up the transition to better alternatives. For more information, please check out TWNSolar.ca and get involved. Together we can inspire the vision of a better world. Let's make that awareness go viral!